Summary: Tunisia’s decentralization process has tremendous potential. Yet the central government, local government, civil society, and international donors must each invest in the process. Tunisia’s May 6, 2018, municipal elections, the country’s first-ever democratic local elections, constitute an important step that will move the country closer toward fully consolidating its democratic transition. By democratically electing 7,200 local officials who will represent 350 municipalities, Tunisians will signal their commitment to democracy. But these elections are only one small piece of a much larger decentralization program, whose fate is uncertain. Elections will be meaningless without a strong legal framework for decentralization that clearly delineates power and responsibility between the national and local levels. The process will also require the political will to implement decentralization at both the national and local levels. On paper, Tunisia has had local governance for some time, with municipal and regional authorities empowered to make some, albeit mostly administrative, decisions. However, the decentralization practiced since Tunisia’s independence in 1956 has been “just pure fiction” according to Tunisian scholar Neji Baccouche.1 In reality, the political system was highly centralized under both presidents Habib Bourguiba and Zine el-Abidine Ben Ali, a “political choice which addressed the need of rebuilding a united state which was able to fight against an ancient tribal system,” as Baccouche put it.2 Most local authorities were appointed by the central state, and they reported to the feared Ministry of the Interior. Tunisia’s decentralization process has the potential to reinvigorate the democratic transition by empowering local actors, improving service delivery, injecting new energy and ideas into the policy process at the local level, and alleviating some pressure on the central government. But the process must provide long-term systemic changes to governance and fiscal authority as well as demonstrate short-term wins, particularly in the country’s traditionally disadvantaged interior regions. Decentralization’s success depends on it. Decentralization also offers the opportunity to experiment and try out different policies. Because policy change is far easier at the local level and needs and resources vary by municipality, decentralization can allow policymakers to evaluate what types of programs and initiatives are most effective and where. Furthermore, national-level bureaucrats and politicians are often more risk-averse than their local-level counterparts; thus, local governments can be more creative in developing policy solutions to local issues. While not all creative solutions are successful, local officials may be more willing to try new ideas, which, if successful, could be replicated elsewhere. Yet for decentralization to be successful, it requires a tremendous amount of preparation as well as certain institutional and psychological conditions. Aside from the overarching plan of devolving administrative and financial power from the central state to the localities, Tunisia’s decentralization efforts have three other goals: to ensure a more equitable distribution of resources; to empower local actors to make decisions for their communities; and to improve service delivery across the country. But for decentralization to be successful, it requires a tremendous amount of preparation as well as certain institutional and psychological conditions. The most important precondition is political will and vision, particularly from the central government. A central government that either attempts decentralization half-heartedly or actively undermines the process will produce failed policies. In addition to a legal framework and the institutional structures aligned with the newly devolved functions, the decentralization program must be backed by significant financial and human resources at both the central and local levels. There must be some form of interbureaucratic management procedures to both ensure accountability and prevent a duplication of efforts. And there must be some form of societal dialogue—at the national and local levels—to invest the public in the process. The public, through civil society organizations and informal networks as well as direct participatory processes, plays a crucial role in providing oversight and accountability. Currently, Tunisia suffers from dramatic regional disparities on virtually all indicators (see table 1). In 2013, eighteen municipalities (including Tunis and its suburbs of La Marsa, La Goulette, Sidi Bou Said, and Carthage) held 51 percent of the state’s municipal budget, while 246 municipalities held the remaining 49 percent.9 A study by the International Labor Organization in June 2017 found dramatic inequality in various regions when comparing the poverty rates, purchasing power, and quality and proximity of public services.10 In the Ben Ali regime’s final budget before it fell, 82 percent of state funds were dedicated to coastal areas, compared to only 18 percent for the interior. Furthermore, in the past, more than 50 percent of the territory was “non-municipalized,” so that more than one-third of the country’s population lived outside of a municipal district and therefore had no ability to elect local officials.11 To ensure every citizen resides in a municipality, the government created eighty-six new municipalities and expanded the territory of several others. Additionally, one of the key pillars of Tunisia’s decentralization process is to correct regional disparities through the process of “positive discrimination.”12 This process is intended to provide for equitable (rather than equal) resource distribution (from state budget support to administrative and human resources) that will eventually level the playing field for all Tunisians, regardless of where they live. Citizens in Tunisia’s traditionally marginalized regions hope that decentralization will bring more attention to their regions. As a civil society activist in Sidi Bouzid noted, as of early 2018 there are no national ministers or highly ranked officials from Sidi Bouzid.14 This contributes to the alienation and physical and psychological distance from the center. One resident of the Siliana Governorate, who is running in the municipal elections in the town of Kesra, said he is hopeful that decentralization will bring improvements to his town because “people will be elected who will respond to the needs and voices of citizens,” unlike the current officials who are inexperienced and take their direction from Tunis.15 The newly elected municipal council will likely have more legitimacy, he said, in part because the members are elected but also because they will “understand the reality of the region.”16 While decentralization will likely not correct the problem of having local interests represented at the national level in Tunis, it will provide the opportunity for Sidi Bouzid’s citizens to make decisions about Sidi Bouzid and Siliana’s citizens to make decisions about Siliana. Residents of Kesra echoed the issue of visibility, hopeful that decentralization will provide them with the chance to show off their region to other Tunisians.17 Few Tunisians—let alone foreigners—are aware of Kesra, which is the highest elevated town in Tunisia and is home to tremendous biodiversity, historical sites, and tourism potential. While tourism increased in Kesra after the revolution, the tourism and agricultural sectors remain vastly underdeveloped. The decentralization process is framed as a way to sustainably correct the long-standing regional disparities by prioritizing certain regions over others. According to civil society actors working on decentralization, Tunisians would most like improvements to already existing services, such as street lighting, waste collection, construction and quality of roads as well as local transport.30 Citizens in Tunisia’s traditionally disadvantaged regions are particularly hopeful on this score. Globally, decentralization has been shown to improve efficiency in the use of public resources as well as increase competition for public resources. Additionally, there is some research that suggests that fiscal decentralization can reduce corruption.32—people can identify the centers of power and how to communicate with them. This is “highly symbolic,” as one activist put it, but easy to achieve.33 Currently, Tunisians receive very little communication from their municipalities. According to a 2015 World Bank survey, only 3 percent of respondents had received any form of communication from their municipality during the previous year.34 Part of the issue is digital infrastructure—many municipalities do not have functioning websites, so municipal officers must use their personal Facebook pages to communicate.35 Furthermore, many municipalities do not have a communications officer, and others have only one or two staff members to cover all issues in an entire municipality. Thus, there is a need for a dramatic increase in local staffing. Another secondary effect of better service delivery is that it can help make municipalities—particularly those in the interior—more attractive to foreign donors and the private sector. For example, there remain dramatic disparities in the road conditions between Tunis in the north and the southern and northwestern regions. Driving south from Tunis, the highway is in good condition to Kairouan, about 100 miles. However, the route then becomes unpredictable—turning at times into a dirt road and at other times into a pristine highway. And due to poor road conditions, the drive southwest from Tunis to Siliana, about 80 miles away, takes longer than the drive from Washington, DC, to Philadelphia, which is nearly twice as far. There is some research that suggests that fiscal decentralization can reduce corruption: by creating more direct links between citizens and authorities, there is more transparency. Finally, the decentralization process is a lengthy endeavor—the government estimates twenty-seven years to fully devolve power to local officials and to bring the most poorly performing municipalities on par with the rest of the country—that risks running out of steam. One participant in a Carnegie-organized workshop noted a fear of partial decentralization. The failure to decentralize fully would create confusion and hinder accountability in both the local and central governments.43 Partial decentralization has been an issue in some cases around the world. In Brazil, Pakistan, and South Africa, local authorities were given administrative powers but not fiscal powers, depriving them of the ability to enact their policy decisions. Tunisia’s traditionally marginalized interior regions have some of the highest expectations for decentralization, but the outcomes are not guaranteed. In conversations with individuals in the interior regions, it was not clear what change they want to see in the short term, other than local control over their affairs. While that is a realistic goal, it will not guarantee the economic development needed by Tunisia’s traditionally marginalized municipalities. As other cases have shown, centralized governments are more effective than local governments at redistributing wealth and alleviating economic disparities. Thus, once decentralization moves forward, and the central government’s power to intervene locally decreases, the ability of the central government to level the playing field across regions might similarly decrease. Many citizens question decentralization’s intentions because the Ministry of the Interior has controlled the process—some officials and activists are uncomfortable with such a centralization of decentralization. The issue of human capacity is crucial. The municipal elections will bring to office thousands of new officials who have had no experience holding public office or running a municipality. While some local and international NGOs are planning training programs for these officials, it will be an incredibly difficult challenge to adequately train so many new officials on the tasks of governing, building consensus, communicating with the public, and working with the central government. This is further exacerbated by the fact that the Local Authorities Code has yet to be publicly released —meaning that these new officials will come to power with very little time to learn about their new responsibilities, let alone how to effectively carry them out. In addition to giving the entire decentralization process top-cover, the national government has three key roles to play in Tunisia’s decentralization process going forward: to devolve power effectively and equitably; to develop a fair and efficient method of fund transfers; and to ensure a qualified workforce at the local level by training and equipping local officials and enticing high performers to take positions in the most marginalized regions. These debates make it clear that disagreement remains over how much power the elected local officials should have and what role the appointed governor should play, as well as about how much power the minister of local affairs and parliament have to interfere in local issues. For decentralization to succeed, it is imperative that the local officials are empowered enough to truly represent their constituents, otherwise the process risks re-creating the toxic authoritarian structures and procedures that plagued the Ben Ali regime as well as contributing to the already dangerously large trust gap between the Tunisian people and their government—or both. To address this, once the Local Authorities Code becomes law and municipal councils are elected, the national government should prioritize quickly transferring power to the local level as well as clearly communicating the boundaries of that power to the public. For Tunisians who have lived under a highly centralized state for decades, the cultural shift to decentralized and localized governance will take time. This shift can be made smoother with full transparency as to who controls what and what citizens can realistically expect from local officials. 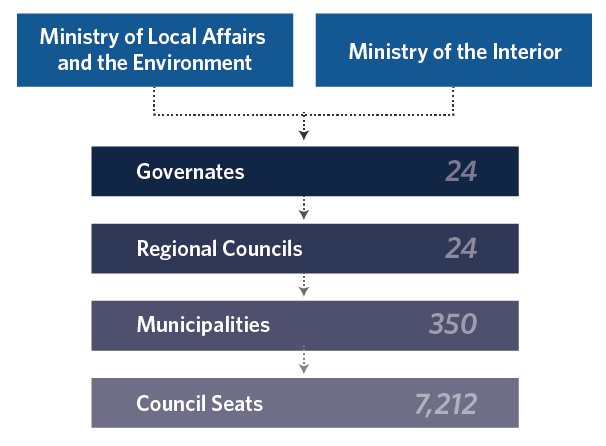 There are three levels of local government—the regional, governorate, and municipal. Tunisia’s twenty-four regions are headed by a centrally appointed governor (wali). The 350 municipalities are each headed by a mayor, who is elected from the members of the municipal council for a five-year term. The mayor is responsible for planning, public security, traffic, and environmental management. The mayor also works with the council to develop the municipal investment plan and to levy municipal taxes.1 The Directorate General for Local Affairs (DGLC), which oversees the municipalities, was previously housed under the Ministry of the Interior, but was moved to the newly created Ministry of Local Affairs and the Environment in 2016. 1 Intissar Kherigi, “How to Make Local Government in Tunisia More Accountable,” Jasmine Foundation, June 2016. 2 Government Decree No. 2017-729 of June 5, 2017. 3 See the Ministry of the Interior’s website, https://www.interieur.gov.tn/fr/. In addition to retaining some modicum of administrative power, the national government will also retain the power of the purse—the ability to provide financial transfers to the localities. Today, Tunis controls 96 percent of public spending, while only 4 percent of the state budget is spent at the local level. This is compared to a global average of 15–35 percent of budgets spent at the local level.80 The decentralization process is attempting to address this issue, and Minister of Local Affairs Mouakher recently stated that he plans to increase the 4 percent to 10 percent within six years, but simply funneling money to the local level is insufficient.81 The government must enact a fair and transparent method of transferring funds downstream and promoting an equitable distribution of resources. A United Nations Development Program report argued that “without appropriate fiscal empowerment, the autonomy of sub-national governments cannot be substantiated and, in this way, the full potential of decentralization cannot be realized.”83 Thus, the national government must “clearly define the assignment of expenditure responsibilities in order to enhance accountability, avoid unproductive overlap . . . duplication of authority and legal challenges.”84 A significant amount of research and thought has already been put into how to most effectively and fairly accomplish this goal through a partnership between the Ministry of Local Affairs and the World Bank (for more details, see the section on the international community). One challenge for decentralization is that many goods and services cannot be easily divided between the national and local levels. Healthcare, education, and transportation all cut across borders. For national officials to reap the benefits of decentralization, such as a decreased workload and better access to information in the far-flung regions, they must have well-qualified partners throughout the country. While some regions—particularly those on the coast—will have no problem attracting the best and the brightest, and can provide high-quality equipment for local government offices, the traditionally marginalized regions will need support from the central government. In addition to the obvious role played by local government in the decentralization process, the municipal councils, mayors, and governors should work to establish healthy administrative and financial relationships with the central government and stimulate engagement across municipal boundaries. Furthermore, local officials should develop methods to formalize and normalize participatory governance. Beyond formal mechanisms for participatory governance, local officials should encourage a culture of participatory governance by civil society and the wider public. Another way to be more responsive to the citizenry is through use of digital documents and electronic governance initiatives. Kherigi recommended “one-stop shops” for citizens in each municipality to provide simplified access to information on government services and procedures.99 These could be both physical as well as digital, to provide even greater ease of use, and would free up time for local bureaucrats who would otherwise be spending hours answering questions in person. A model could be the Washington, DC, government’s 311 service, which is available by phone, app, and web portal, allowing residents to contact the appropriate local government office for the work they need. By phone, citizens dial 3-1-1 and are directed by an operator to the appropriate office. Using the app or website, citizens can report issues (such as a missed trash pick-up or a pothole), see other issues that have been reported, contact the mayor, or grade local services and agencies. Beyond formal mechanisms for participatory governance, local officials should encourage a culture of participatory governance by civil society and the wider public. Much of the citizen engagement process is discretionary, and in a country where public participation was nonexistent, or dangerous, for decades, local officials will need to work with civil society to encourage public participation. This can benefit all parties. Local officials benefit because they are better able to respond to their citizenry, which makes it more likely that they will be viewed as effective and stay in power. And citizens undoubtedly benefit from stronger public engagement because their priorities and preferences are more likely to be translated into public policies. Furthermore, public engagement supported by the local government can help prevent the sort of massive trust gap that Tunisians currently have with the national government. Civil society has a crucial role to play both in developing Tunisia’s decentralization process as well as in implementing it, including serving as a watchdog over the local and national governments; collecting and communicating citizen preferences to local officials; and encouraging and engaging in participatory governance. Tunisian civil society has been particularly adept at serving as a watchdog of the national government. And several of the country’s most powerful and effective national organizations—Al Bawsala, Mourakiboun, and Barr al Aman—have demonstrated the ability and desire to play this role at the local level. Al Bawsala’s Marsad Baladia project was launched in January 2014 to monitor municipalities and connect citizens to them.100 The Marsad Baladia team collects information on the municipal budget, human resources, property, investments, and activity of the municipal council and publishes that information on the project’s website. Barr al Aman works to improve governance through the media. Their hour-long weekly radio program focuses on elected local and national bodies. It seeks to “present concretely and close to the reality of citizens issues related to decentralization, the next local elections, but also the administrative procedures, the functioning and dysfunction of state institutions.”103 Additionally, national organizations like Kolna Tounes have local branches throughout the country that are run by local activists and seek to address local issues. Civil society has a crucial role to play both in developing Tunisia’s decentralization process as well as in implementing it. have an approved memorandum of understanding with the Tunisian Common Loan Fund (known by its French acronym CPSCL). Beyond those conditions, municipalities are graded on a 100-point scale, with indicators covering governance, sustainability, and management. Municipalities are assessed by an independent audit, and the results are available on the Local Government Portal. If the municipality receives a grade of 70 or above, their grants will double for 2018 and beyond.123 In the first year, more than 90 percent of municipalities fulfilled the five basic criteria to give them access to grants for 2016. Tunisia’s decentralization process has tremendous potential. It is both symbolically important as a key step toward fully consolidating the country’s democratic transition as well as a practical step toward correcting some of the regional injustices that occurred prior to the revolution. By empowering local actors and improving service delivery, the government’s decentralization effort could help narrow the vast trust gap with Tunisians. However, to be successful, the central government, local government, civil society, and international donors must each invest in the process. Manage public expectations by clearly communicating about the devolution of administrative and financial power. This includes publicizing the twenty-seven-year plan, which members of parliament had yet to receive as of this writing,124 as well as short- and long-term benchmarks upon which the decentralization process will be evaluated by the Ministry of Local Affairs. The ministry should also make publicly available the outcomes of the extensive global research that led to the draft Local Authorities Code. Develop an incentive structure to encourage highly qualified civil servants to serve in the most marginalized regions. This could include bonus pay or basing promotions on required service in certain regions. Ensure a proper public review process for public participation at the local level. The Local Authorities Code does not adequately address the specifics of participatory democracy, instead leaving these to a Guide on Participation to be mandated by a government decree. The idea of issuing a decree on public participation is antithetical to participatory democracy. Rather, the state should issue a draft decree and provide sufficient time and opportunity for nationwide review and stakeholder input into the guide. Provide opportunities for participatory governance outside of those mandated by the law, such as the creation of citizen councils or regular policy preference surveys. Devise mechanisms for cross-municipality collaboration and communication. Local officials should focus first on their own territory, but should also work with local officials in neighboring municipalities to discuss issues that bleed across borders and to brainstorm creative policy solutions. Conduct an outreach campaign to the public regarding decentralization. This should be led by local grassroots organizations that have strong credibility in their municipalities and should focus on explaining the role of the municipal council under the Local Authorities Code as well as the opportunities for public participation in local government. Connect citizens with participatory governance mechanisms. Civil society should both serve as a knowledge base regarding participation opportunities as well as a conduit between the public and local officials. Civil society should devise mechanisms to capture citizen preferences and communicate those preferences to local officials—either through town halls, formal advisory roles, digital comment forms, or informal channels. Train and equip local officials based on best practices from around the globe. In partnership with the private sector, donors could ensure that local officials across the country have access to appropriate technological resources to enable them to communicate with Tunis as well as with their constituents. Donors should also train local officials on how to most effectively carry out their duties. The authors would like to thank Houda Mzioudet and Kareem Asfari for their exceptional research assistance. They would also like to thank Samuel Brase, Michele Dunne, Intissar Kherigi, Lori Merritt, Blair Scott, and Jocelyn Soly for their valuable contributions to this paper. They offer their gratitude to the participants in Carnegie’s February 2018 civil society workshop in Tunis as well as those individuals whom the authors interviewed in the course of the research. Finally, they are deeply grateful to the Open Society Foundations for its generous support of this paper and the larger Tunisia Monitor project. Cover photo source: Congress of Local and Regional Authorities, photograph from “Municipal Elections in Tunisia: Congress Carries Out Electoral Assessment Mission,” taken May 6, 2018, Council of Europe, available at: https://www.flickr.com/photos/congress-of-local-and-regional-authorities/27069512317/in/dateposted. 1 Néji Baccouche, “Decentralization in Tunisia: Challenges and Prospects,” in Federalism: A Success Story?, ed. Hanns Buhler, Susanne Luther, and Volker L. Plan (Munich: Hanns Seidle Stiftung, 2016). 3 Hayfa Dhouib, “Discussion With Mokhtar Hammami on Decentralization: A New Approach in a Structural Crisis” [in Arabic], Nawaat, July 20, 2017; Hammami is a former Ministry of Interior official who recently retired, but has retained a position within the Ministry of Local Affairs as the head of the Higher Committee for Overseeing and Planning the Decentralization Process. 6 Ivar Kolstad and Odd-Helge Fjeldstad, “Decentralization and Corruption: A Brief Overview of the Issues,” Chr. Michelsen Institute, 2006. 7 Mushtaq H. Khan, “Corruption and Governance in Early Capitalism: World Bank Strategies and Their Limitations,” in Reinventing the World Bank, ed. Jonathan R. Pincus and Jeffrey A. Winters (Ithica, NY: Cornell University Press, 2002). 8 Remarks by Riadh Mouaker at a Carnegie Endowment for International Peace roundtable, February 9, 2018, Tunis, Tunisia. 9 Yassine Bellamine, “A quand un projet de loi de décentralisation?” [When is the decentralization bill? ], Nawaat, January 22, 2015, https://nawaat.org/portail/2015/01/22/a-quand-un-projet-de-loi-de-decentralisation-1e-partie/. 10 “La Discrimination Positive: un principe constitutionnel à concrétiser pour la promotion de l’emploi décent dans les regions” [Positive discrimination: a constitutional principle to be achieved for the promotion of employment in the regions], International Labor Organization, June 2017, http://www.itceq.tn/upload/files/etudes/discrimination-positive-2017.pdf. 11 Ines Labiadh, “Décentralisation et renforcement du pouvoir local : La Tunisie a l’épreuve des réformes institutionnelles” [Decentralization and the strengthening of local power : Tunisia facing institutional reforms] (Maillages territoriaux, démocratie et élection, January 2016, Monastir, Tunisia). 12 Author interview with Ministry of Local Affairs official, February 2018, Tunis, Tunisia. 13 “La Discrimination Positive,” International Labor Organization. 14 Author interview with civil society activist in Sidi Bouzid, February 2018, Sidi Bouzid, Tunisia. 15 Author interview with candidate for local elections, February 2018, Kesra, Tunisia. 16 Author interview with candidate for municipal elections, February 2018, Kesra, Tunisia. 17 Author interview with civil society activists in, February 2018, Kesra, Tunisia. 18 Author interview with candidate for local elections, February 2018, Kesra, Tunisia. 19 Author interview with candidate for municipal elections, February 2018, Kesra, Tunisia. 20 “Strengthening Local Governments in Tunisia as a First Step Toward Decentralization,” World Bank, July 24, 2014, http://www.worldbank.org/en/news/feature/2014/07/24/strengthening-local-governments-in-tunisia-as-a-first-step-toward-decentralization. 21 Pranab Bardhan, “Decentralization of Governance and Development,” Journal of Economic Perspectives 16, no. 4 (Autumn 2002): 185–205. 22 Joseph Ayee, “The Adjustment of Central Bodies to Decentralization: The Case of the Ghanaian Bureaucracy,” African Studies Review 40, no. 2 (September 1997): 37–57. 23 Author interview with civil society activist, February 2018, Tunis, Tunisia. 24 “Loi organique n° 2017-7 du 14 février 2017, modifiant et complétant la loi organique n° 2014-16 du 26 mai 2014 relative aux élections et référendums” [Organic Law No. 2017-7 of February 14, 2017, amending and supplementing Organic Law No. 2014-16 of May 26, 2014 on Elections and Referendums], Tunisian National Portal of Legal Information, February 14, 2017, http://www.legislation.tn/sites/default/files/fraction-journal-officiel/2017/2017F/014/Tf201771.pdf. 26 Mohamed Ali Litfi, “Young Tunisians Have High Hopes for May’s Municipal Elections,” Al Monitor, March 23, 2018, http://www.al-monitor.com/pulse/originals/2018/03/tunisia-elections-municipal-youth-candidates-women-new-blood.html#ixzz5BXkNguzw. 27 See, for example: Nicoletta Feruglio and Dallas Anderson, “Fiscal Decentralization: An Overview” in Fiscal Decentralization Handbook, ed. Feruglio and Anderson (New York: United Nations Development Program, December 2007). 30 Discussion with civil society activists, February 2018, Tunis, Tunisia. 31 Center for Insights in Survey Research, “Public Opinion Survey of Tunisians: November 23-December 3, 2017,” International Republican Institute, January 10, 2018, http://www.iri.org/sites/default/files/2018-01-10_tunisia_poll_presentation.pdf. 32 Stacey White, “Government Decentralization in the 21st Century: A Literature Review,” Center for Strategic and International Studies, December 30, 2011. 33 Discussion with civil society activists, February 2018, Tunis, Tunisia. 36 For more on the relationship between bureaucracy and governance in Tunisia see Sarah Yerkes and Marwan Muasher, “Tunisia’s Corruption Contagion: A Transition at Risk,” Carnegie Endowment for International Peace, October 25, 2017, http://carnegieendowment.org/2017/10/25/tunisia-s-corruption-contagion-transition-at-risk-pub-73522. 37 Dimce Nikolov, “Decentralization and Decentralized Governance for Enhancing Delivery of Services in Transition Conditions” (prepared as background for the Regional Forum on Enhancing Trust in Government Through Leadership Capacity Building, September 28–30, 2006, St. Petersburg, Russia), United Nations, 2006. 38 Author interview with member of parliament, March 2018, Washington, DC. 39 Hayfa Dhouib, “Elections municipales : démystification d’une désaffection citoyenne” [Municipal elections: demystification of a disaffected citizen], Nawaat, March 13, 2018, http://nawaat.org/portail/2018/03/13/elections-municipales-demystification-dune-desaffection-citoyenne/. 40 Author discussion with members of Tunisian civil society, February 2018, Tunis, Tunisia. 41 “Combining Art and Data to Support Tunisia’s First Municipal Elections,” Democracy International, October 23, 2017, http://democracyinternational.tumblr.com/post/166712501972/combining-art-and-data-to-support-tunisias-first. 42 Author interview with civil society activist, February 2018, Sidi Bouzid, Tunisia. 43 Author discussion with members of Tunisian civil society, February 2018, Tunis, Tunisia. 46 Hilton Root, Anh Pham, and Anne Spahr, “Policy Challenges of Decentralization in Tunisia,” USAID, December 18, 2016. 47 Author interview with official from the Ministry of Local Affairs and the Environment, February 2018, Tunis, Tunisia. 48 Author interview with delegate from Sidi Bouzid, February 2018. 49 Nadia Dejoui, “Municipales, entre mythologie et pragmatism” [Municipals, between myth and pragmatism], Le Economiste Maghrébin, February 26, 2018, https://www.leconomistemaghrebin.com/2018/02/26/municipales-entre-mythologie-et-pragmatisme/. 52 Kent Eaton, “Risky Business: Decentralization From Above in Chile and Uruguay,” Comparative Politics 37, no. 1 (October 2004): 1–22. 53 The Tunisian constitution can be found at: “Tunisia 2014,” Constitute, https://constituteproject.org/constitution/Tunisia_2014?lang=en. 55 Author discussion with members of Tunisian civil society, February 2018, Tunis, Tunisia. 56 Security forces will vote on April 29. The rest of the public will vote on May 6. The elections were originally scheduled for October 2016, but were postponed to March 2017, then to December 2017, then again to March 2018 and finally to May 2018 due to a variety of logistical and political factors. 57 Author discussion with members of Tunisian civil society, February 2018, Tunis, Tunisia. 58 Author’s conversation with civil society activist, February 2018, Tunis, Tunisia. 59 Hela Yousfi, “Redessiner les relations Etat/collectivités locales en Tunisie : enjeux socio-culturels et institutionnels du projet de décentralisation.” [Redefining state-local relations in Tunisia: socio-cultural and institutional issues of the decentralization project. ], Papiers de Recherché AFD, no. 2017–47, June 2017. 62 Deborah Kimble, Jamie Boex, and Ginka Kapitanova, “Making Decentralization Work in Developing Countries: Transforming Local Government Entities Into High-Performing Local Government Organizations,” Center on International Development and Governance, Urban Institute, November 2012. 63 “Institutional Development and Transition: Decentralization in the Course of Political Transformation,” United Nations Economic and Social Commission for Western Asia, October 22, 2013. 64 Arun Agrawal and Jesse Ribot, “Accountability in Decentralization: A Framework With South Asian and West African Cases,” Journal of Developing Areas 33, no. 4 (Summer 1999) : 473–502. 67 Bardhan, “Decentralization of Governance and Development”; Daniel Triesman, “Decentralization and the Quality of Government” (draft paper), November 20, 2000. 70 Vito Tanzi, “Pitfalls on the Road to Fiscal Decentralization,” Carnegie Endowment for International Peace, April 2001. 72 “Un meilleur contrôle pour une meilleure gouvernance locale en Tunisie : Le contrôle des finances publiques au niveau local.” [Better control for better local governance in Tunisia: Public financial control at the local level. ], Organization for Economic Cooperation and Development, 2016. 73 “Democratic Decentralization Programming Handbook,” USAID, June 2009. 75 Intissar Kherigi, “How to Make Local Government in Tunisia More Accountable,” Jasmine Foundation, June 2016. 76 “Projet de loi organique N°48/2017 portant promulgation du code des collectivités locales” [Organic Law No. 48/2017 Promulgating the Local Collectivities Code], Marsad Majles, https://majles.marsad.tn/2014/fr/lois/591dbe75cf4412226ec753d9/chroniques. 80 Intisar Kherigi, “Local Elections in Tunisia: The Last Hope for Real Change,” Middle East Eye, October 6, 2017. 81 “The Government and Raising the Budget for Municipalities” [in Arabic], Al-Maghrib, March 29, 2018. 82 Abderrazak Zouari, “White Paper on Decentralization” [in French], Government of Tunisia, November 2011. 85 Remy Prud’homme, “The Dangers of Decentralization,” World Bank Research Observer 10, no. 2 (August 1995): 201–20. 88 “A New Horizon for Local Governments in Tunisia,” World Bank, October 20, 2015, http://www.worldbank.org/en/news/feature/2015/10/19/a-new-horizon-for-local-governments-in-tunisia. 89 Frédéric Volpi, Fabio Merone, and Chiara Loschi, “Local (R)evolutions in Tunisia, 2011–2014: Reconstructing Municipal Political Authority,” Middle East Journal 70, no 3 (Summer 2016): 365–81. 91 Author conversation with Tunisian scholar, March 2018. 93 “Projet de loi organique N°48/2017 portant promulgation du code des collectivités locales” [Organic Law No. 48/2017 Promulgating the Local Collectivities Code], Marsad Majles, https://majles.marsad.tn/2014/fr/lois/591dbe75cf4412226ec753d9/chroniques. 95 “Participatory Budgeting in Tunisia: Seizing Opportunities for Municipal Civic Engagement,” Tadamun, March 29, 2016, http://www.tadamun.co/2016/03/29/participatory-budgeting-tunisia-seizing-opportunities-municipal-civic-engagement/?lang=en#.WutuV4gvyUk. 97 “Democratic Decentralization Programming Handbook,” USAID. 98 Author discussion with Intissar Kherigi, March 2018, email. 100 Website of Marsad Baladia, http://baladia.marsad.tn/fr/page/about. 101 Website of Tunisia Elections, http://www.tunisieelections.org/about. 102 “Rapport Final sur l’état des lieux des centres de santé de base” [Final report on the state of basic health centers], Mourakiboun, January 2017. 103 Webite of Barr al Aman, http://news.barralaman.tn/fr/fr_apropos/. 106 Leo Siebert, “Civic Education in Sidi Bouzid on the Anniversary of Mohamed Bouazizi,” International Republic Institute, February 6, 2018. 107 Author nterview with civil society activist, February 2018, Sidi Bouzid, Tunisia. 109 Author interview with civil society activist, February 2018, Tunis, Tunisia. 110 Author interview with civil society activist, February 2018, Kessra, Tunisia. 111 Author interview with civil society activists, February 2018, Tunis, Tunisia. 112 Article 139 of the Tunisian constitution, “Tunisia 2014,” Constitute, https://constituteproject.org/constitution/Tunisia_2014?lang=en. 113 Author interview with civil society activists, February 2018, Tunis, Tunisia. 114 Ronald W. Johnson and Henry P. Minis, Jr., “Toward Democratic Decentralization: Approaches to Promoting Good Governance,” Research Triangle Institute, 1996. 115 Henry P. Minis, Jr., “Recommendations for a Citizen Participation Program,” USAID, March 1997, https://pdf.usaid.gov/pdf_docs/Pnacd966.pdf. 117 Author interview with civil society activists, February 2018, Tunis, Tunisia. 118 Author interview with Tunisian member of parliament, February 2018, Tunis, Tunisia. 119 Author interview with civil society activist, February 2018, Sidi Bouzid, Tunisia. 120 “Portail des les collectivités locales” [Local Collectivities Portal], Tunisian Ministry of Local Affairs and the Environment, http://www.collectiviteslocales.gov.tn/. 122 “Transparency and Accountability: Keys to Tunisia’s Decentralization Success,” World Bank, September 15, 2016, http://www.worldbank.org/en/news/feature/2016/09/09/transparency-and-accountability-keys-to-tunisia-s-decentralization-success. 124 The authors also repeatedly asked the Ministry of Local Affairs to provide us with a copy of the twenty-seven-year plan but received no response.